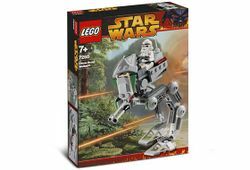 7250 Clone Scout Walker is a LEGO Star Wars Revenge of the Sith set released in 2005. It included one Minifigure, a Clone Recon Trooper. The set contains one module based after the AT-RT Walker from the third Star Wars movie. The Clone Scout Walker contains 108 pieces. The front swivels, along with its blasters, while the legs have joints at three different points to simulate walking. The blaster carried by the Clone Recon Trooper can be stored on the side of the walker by attaching it to a peg. There is a control stick for the pilot and the front of the vehicle is specially printed to look like the walkers from Star Wars Episode III: Revenge of the Sith. The Clone Scout Walker, known properly as the All Terrain Recon Transport (or the AT-RT for short), was a one-man walker utilized by the Grand Army of the Republic for patrolling and reconnaissance missions. It left the driver sitting on the saddle-like seat exposed to fire, but compared to other walkers it was very quick and, combined with its low-cost, was strong competition for with other clunky vehicles used on the battlefield. The main weapons of the AT-RT were a laser cannon and mortar launcher which made it good for anti-infantry duties. It also was equipped with motion detection scanners and other sensors and some units used later by the Rebel Alliance had the mortar launcher replaced with a strong floodlight. They were also used for regular policing, due to their versatility and speed. This is the only set to contain the Clone Recon Trooper. This is a description taken from LEGO.com. Please do not modify it. The Clone Scout Walker is on the march! Clone troopers are ready for action on any world in the clone scout walker. These powerful machines keep the Trade Federation and its allies on the run. Head, legs, and blasters move. Facts about "7250 Clone Scout Walker"
The Clone Scout Walker is on the march!